A prison riot Wednesday in the troubled Mexican border town of Juarez left 20 dead and 15 wounded, an official said. None of the dead were police or military officials, said Enrique Torres, a spokesman for the joint operation at the Cereso Estatal de Ciudad Juarez prison. Authorities called in 200 federal police agents and 50 army soldiers to help put down the riot; two helicopters and an airplane also were employed, he said. The uprising occurred among members of the Aztecas drug gang housed in Module 3, El Diario quoted police official Carlos Gonzalez as saying. Some inmates were armed, the newspaper said. El Universal newspaper said the “Los Artistas Asesinos,” or the Assassin Artists, also were involved in the riot. The high-security prison houses many of the nation’s most dangerous drug traffickers. The uprising started at 7 a.m. local time and was quelled two hours later, El Universal said. The prison is located in a semi-desert area 17 miles (28 kilometers) south of Ciudad Juarez, which is across the border from El Paso, Texas. 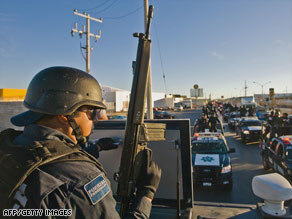 Juarez is one of the major battlegrounds as drug cartels fight each other and Mexican authorities. “The situation in Ciudad Juarez is of special concern,” the U.S. State Department said in a travel warning issued February 20. “Mexican authorities report that more than 1,800 people have been killed in the city since January 2008. Additionally, this city of 1.6 million people experienced more than 17,000 car thefts and 1,650 carjackings in 2008.” Nationwide, Mexican officials report that more than 5,400 people were killed in 2008, more than double the tally for the previous year.